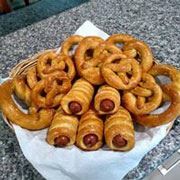 Most people know and love the pretzel. In the German language a pretzel is called “Brezel.” There are about 120 different types of pretzels. The variety goes from savory to zesty to sweet. Whether soft or hard, there is a pretzel for everyone to enjoy. Come join Sandra in her home to learn how to make these delights! Along with the class she will give you some interesting history about pretzels. Location: Address will come in your confirmation email after payment.